This is a collection of songs featuring the consonant blends, digraphs and trigraphs contained in the new "Letterland Teacher's Guide". It is great to sing, then go over each rhyming text for guided reading. About Fiona Pritchard (Author) : Fiona Pritchard is a published editor and a narrator of children's books. 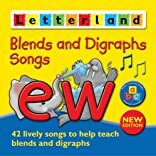 Published credits of Fiona Pritchard include Action Songs (Letterland), Smile! (First Steps), and Stop! (First Steps).